While it is possible to learn how to run a Cat excavator without doing so, the proper way to learn how to run a Cat excavator is to go to heavy equipment school. While is is possible to learn on the job, the school makes passing the license exam much easier. If, however, you have access to a Cat excavator, wide open spaces and lots of patience, it is possible to learn to run a Cat excavator in just a few hours of practice. It is highly advised to be far away from other people, cars and buildings while learning the process. Locate the lubrication chart for the machine. This is usually adhered to the inside of the cab side window. If you don't find it there, check the operator manual. After locating the chart, proceed to pump two or three pumps of grease in each fitting shown as requiring daily lubrication. This step is important as these machines work hard and require frequent lubrication. Enter the cab and sit in the operator seat. Adjust the seat to the most comfortable position for you and fasten the seat belt. Insert the ignition key in the ignition switch and turn to the right to start the engine. Immediately check all gauges for proper operation. Allow the engine to idle until the temperature gauge indicates the machine is warmed up. Turn the throttle knob to raise the rpms of the engine. 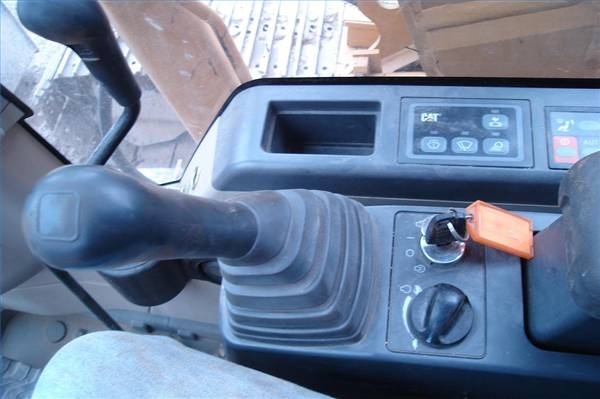 Put the hydraulic lockout lever in the down position to allow the hydraulics to operate. This lever is located to the left of the operator seat. Push it forward and down until it stops. All hydraulic systems on the machine will now operate. Be aware that any control lever moved at this point will cause movement of some part of the machine. Be certain you know what you want to do before moving a control lever. 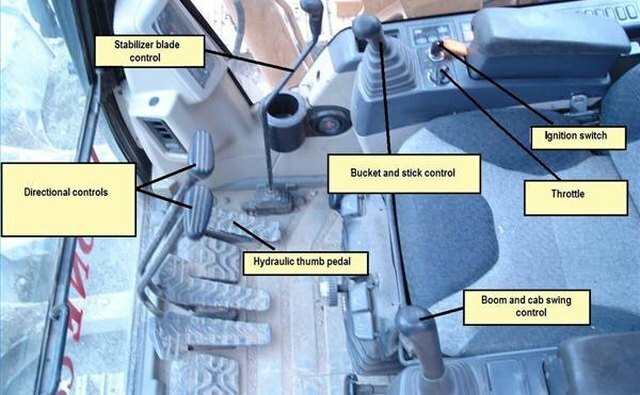 Lift the stabilizer blade with the tall control lever on the window side of the cab. Pull the lever toward the rear of the machine to raise the blade. Crawl the machine with the levers in front of you. Pushing the levers toward the stabilizer blade will cause the machine to move in that direction; pulling them back will reverse the machine. There are also two pedals attached to the bottom of these control levers to allow forward and backward movement while your hands are on other controls. 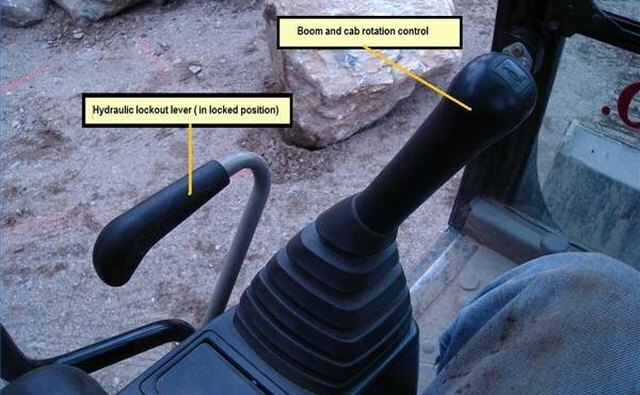 Maneuver the boom with the control lever near the left armrest of the seat. Push the lever forward to lower the boom; pull the lever back to make the boom move more vertically. 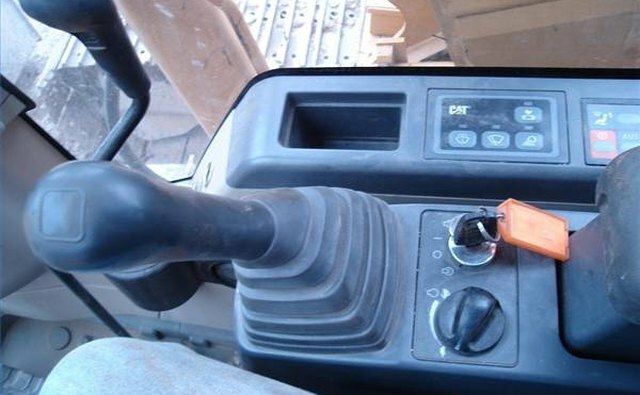 Be aware that pushing this lever to the side will cause the cab to rotate in a circle. 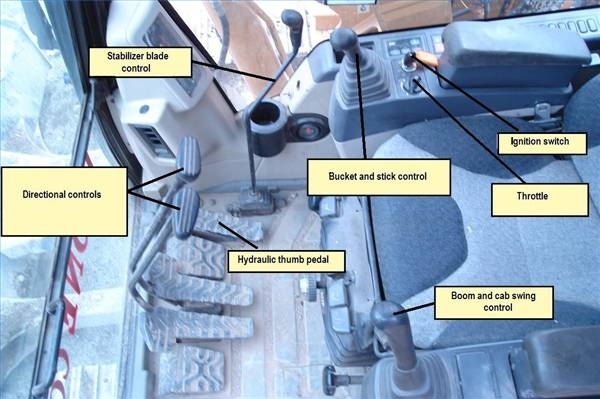 Extend the stick (the forward part of the boom) with the control lever nearest the right armrest. 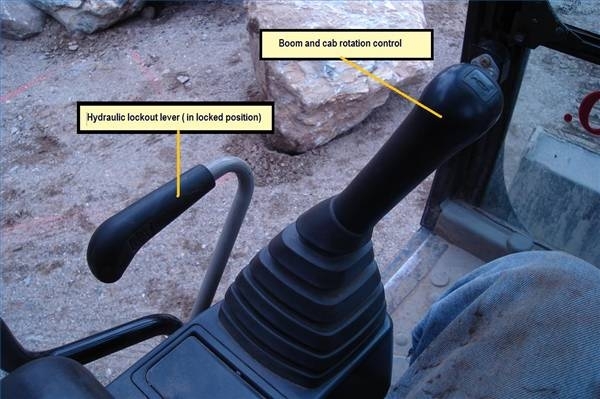 Pushing this lever forward will extend the stick forward away from the cab; pulling the lever back will cause the stick to retract toward the cab. This same lever, when moved to the sides, will cause the bucket to curl toward, or away from, the machine. Dig a hole by extending the stick while lowering the boom and curling the bucket to attack the ground surface with the bucket teeth in a near vertical position. As soon as the teeth have entered the ground start to curl the bucket back, slightly, while also retracting the stick and raising the boom. Just like it sounds, this is a combination of movements that requires coordination of all the control levers. Practice makes perfect here. Dump the bucket onto a pile or into a truck by rotating the cab while also curling the bucket in toward the cab and raising and extending the boom and stick. When the bucket is in the proper position, stop the machine rotation and curl the bucket open until the material is dumped. Leave the machine in a safe manner when you are done. This means blade down, boom up, stick vertical and bucket resting flat on the ground. Shut off the engine and remove the key. Exit the cab backward while holding onto the hand holds. These machines are very quick and very powerful; use extreme care when operating any excavator. Clear the area of all people and animals Move any vehicles safely away from your work area.